Charlie Sheen may be struggling to fix his marriage to Brooke Mueller, but according to Jon Cryer, the actor's personal drama hasn't affected his craft. "He's been incredibly professional, always, but especially in times of personal crisis," Cryer, Sheen's co-star on "Two and a Half Men," tells People magazine. "He is solid as a rock [and] today was no different... It's a very funny episode so it went well." On Christmas Day, Charlie was arrested after fighting with his wife and allegedly pulling a knife on her. Sheen's professionalism on-set is noteworthy -- but Cryer admits Charlie seems down. "He was in his usual good humor on read-through day but obviously with the weight of something hanging on him a bit." Jon, who's worked with Charlie for seven years, says he was in "total shock" when he heard about the actor's arrest. "He's been a good friend to me and it's painful," he says. "I love them both and they're a lovely couple... I don't see that side of him. To me, he's been a great, loyal friend and a lovely guy to work with. He's a guy who dotes on his kids as much as any other father." 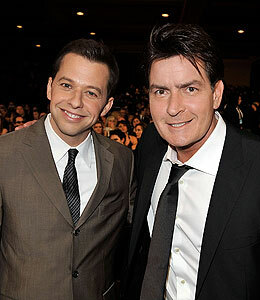 Cryer adds that much of Sheen's disappointment could come from his reported alcohol relapse. "I know Charlie was immensely proud of his years of sobriety and I think that is the hardest thing they're both dealing with right now," says Jon. "I know it was very important to him and I'm sure that's one of the saddest aspects for him." Brooke's mother recently announced that her daughter wants to "reconcile" with Sheen.